I likened this to the Filipino version of the meatloaf. Minced pork mixed with spices and other ingredients then steamed or baked. This is a do-ahead favourite of mine since it freezes well. The hard boiled egg and the chorizo are optional. I often do it without them and they're just as good. For the liver pâté, use the coarse grained type like country pâté, Ardennes, or Belgian. I use coarse because it's easier to mix in with the rest. The fine grained ones are usually too tightly packed and it's an ordeal trying to homogenously mix it in. Slicing the hard boiled egg was tricky for me at first. I found a quarter lengthwise too big and an eighth too small. So I cut it lengthwise in half first then cut each halves into thirds making the size just right. There are many ways to serve it: as cold cuts; lightly pan fried whole then sliced; or sliced then lightly pan fry the pieces. The usual dip accompanying this is ketchup, sweet chilli sauce, or any sweet and sour sauce. Enjoy! Beat eggs; add salt and pepper, making sure the salt is mostly dissolved in the eggs. Add in all the other ingredients except chorizos and hard boiled eggs; mix well. Take a piece of aluminum foil about 10 - 12 inches in length. Lay it on a flat surface and put about 1 cup of the mixture on it. 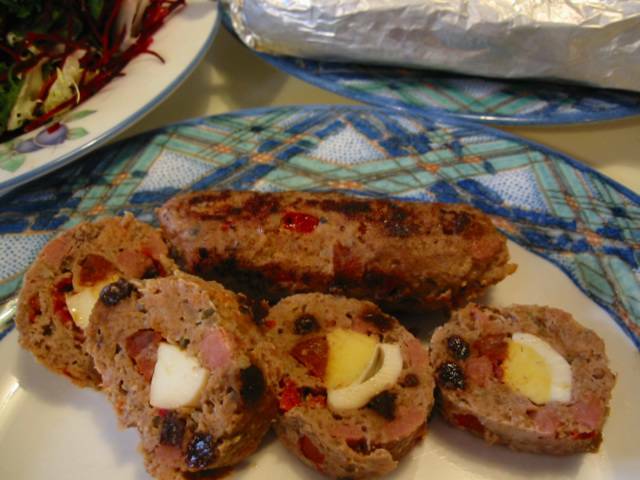 Form the mixture into a long narrow rectangle shape and put the fillings of chorizos and the hard boiled egg along the length in the middle. Enclose the fillings with the outer edges of the pork mixture, shaping it into a log making sure that the chorizos and the hard boiled eggs are in the middle. Roll the log like a jelly roll all the while wrapping it in the foil. Pinch and twist the ends to secure. Arrange in a steamer and steam for 1 hour. Remove foil and serve while warm or as cold cuts. Can also be served by pan frying lightly then slicing or slicing first then pan frying lightly. Serve with ketchup or sweet and sour sauce. Note: The chorizo and hardboiled egg in the middle is entirely optional. try using chinese sausage instead of vienna sausage. use chopped carrots instead of red bell pepper. add frozen green peas and use bread crumbs instead of flour.